Creating backups or duplicates is highly recommended among mobile device users especially when attempting to make new changes on the device settings. New changes that are implemented such as update installation and other user configurations can yield to either bad or good outcomes. Changing the default settings or configuring options on your iPhone for instance, all according to your preferences may sometimes be carried out with errors thus resulting to unusual behaviors on certain apps or the device itself. Unless you know of what you are doing and that you’re fully aware of what the new changes does when implemented, then modifying the original device configuration won’t be an issue. There are many instances when changes are necessary so as to keep the device system optimized and free from glitches. For example, your new iPhone 7 which originally runs on the iOS 10 platform suddenly stops working as intended due to some bugs that messed up the system structure. In an attempt to fix the glitch, you would resort to some applicable workarounds like configuring some settings, setting other options, or updating the app or iPhone software as potential solutions. Considering the possibility that pertinent changes can sometimes go wrong, creating a backup is highly recommended. Doing so will give you an option to go back or restore to a previous backup when needed. There are two main options to back up your iPhone 7. You can back up your device through iCloud or iTunes. If this is your first attempt and that you need further assistance in backing up your new iPhone using iCloud or iTunes then feel free to refer to this content. This post outlines a step-by-step guide on how to back up your device through iCloud or iTunes as well as some tips on how to manage your backup. Read on to learn more. Backing up means you will create a copy of your information to use in case your iPhone or other device is ever replaced, damaged or lost. In other words, backups serve as safe copy of your entire device. By backing up, you can copy and save information on your iPhone 7 or any iOS device and use this backup to transfer the information to a new iOS device if necessary. Users of iOS devices may opt to create backups using iClouds or iTunes as they prefer. Or you can do both (one in iCloud and another in iTunes) if you think you need an alternative backup. iCloud is a cloud storage and cloud computing service for Apple devices. All you need to get started is your Apple ID and with that you can set up a dedicated iCloud account. You can set up or access iCloud on iOS devices, Mac and Windows computer. If you prefer to use iCloud in making a backup of your iPhone 7, you will need to secure a stable Wi-Fi network connection. For as long as your device is connected, iCloud will do the rest in creating backups of data and settings stored on your iPhone. Existing data or information that is already stored in iCloud, such as Contacts, Calendars, Notes, My Photo Stream, and iCloud Photo Library. Data stored in other cloud services such as Gmail and Exchange Mail, Touch ID and Apple Pay settings and information will also be excluded in the iCloud backup. You can create an iCloud backup manually or automatically. Step 1. Connect your iPhone to your Wi-Fi network, if necessary. To do so, go to Settings-> Wi-Fi, then toggle the Wi-Fi switch to turn enable it. Your iPhone will automatically search for Wi-Fi networks available. Just tap to select your preferred network to join or connect to. A checkmark will then show before the selected network and the Wi-Fi icon shows in the upper left corner of the display. Step 2. Once you’re iPhone is connected to Wi-Fi, go to Settings-> [your name] -> then tap iCloud. If your iPhone is running on iOS 10.2 or earlier versions go to Settings, scroll down and tap to select iCloud. Step 3. Tap iCloud Backup or Backup (for iOS 10.2 or earlier). Ensure that iCloud Backup option is enabled or turned on. Step 4. Tap Back Up Now to continue. Make sure your iPhone stays connected to the Wi-Fi network until the entire process is finished. Step 5. Once the iCloud backup is successfully created, go to Settings-> [your name] -> iCloud -> iCloud Storage -> Manage Storage, then select your iPhone 7 from the list. If your iPhone is running on iOS 10.2 or earlier versions, go to Settings-> iCloud-> Storage-> Manage Storage-> then select your iPhone 7 from the list. You will then see the recently created iCloud backup of your iPhone 7 in the details along with the time and backup size. Step 1. Enable or turn on iCloud Backup on your iPhone settings. To do so, go to Settings-> [your name]-> iCloud-> iCloud Backup or Settings-> iCloud-> Backup, if you are on iOS 10.2 or earlier platform. This to ensure that your iPhone has enough power and thus, there will be no power interruptions in the later process. Step 3. Connect your iPhone to a Wi-Fi network, if necessary. Again, your device needs an active and stable network connection to access the iCloud server. Step 4. Ensure that your iPhone 7 screen is locked. If necessary, configure the display settings for your iPhone screen to lock after a specific time of inactivity (idle time). Step 5. Verify and ensure that your device has enough space available in iCloud for backup. Typically, you will get 5GB of iCloud storage for free when you sign in to iCloud. If you need more storage space, you can purchase more from your iPhone for additional fee per month. When it comes to iOS device management, iTunes is a popular platform to use. It is Apple’s patented mobile device management app used for various purposes like downloading, organizing, and backing up contents on iOS and Mac devices. In order to use iTunes, you will need to secure a Windows or Mac computer that runs the program. Just be sure to use the latest version of iTunes so as to evade from having issues inflicted by software incompatibility. Step 1. Launch the iTunes program on your computer. Open iTunes on the computer to get started. Step 2. Enter the correct passcode if necessary. If prompted, enter the passcode for your device or click the option to Trust This Computer to proceed.Just follow the onscreen instructions. In case you forgot your passcode, you may try to remove your passcode by erasing your device (factory reset) with iTunes. 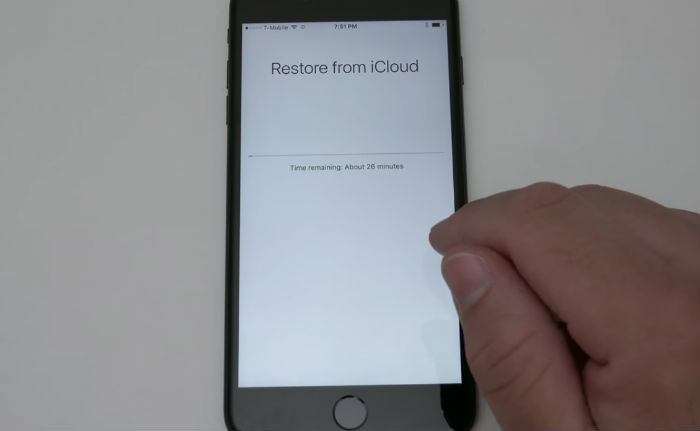 You can restore your device for as long as it is synced with iTunes. Doing so will erase the device and its passcode. Alternatively, you can remove your passcode by erasing your iPhone 7 with iCloud. This is possible given that you have set up Find My iPhone on your iPhone 7 beforehand. If you haven’t synced your device with iTunes or set up Find My iPhone in iCloud yet, then you can’t consider iTunes or iCloud as your option. In this case, you may resort to erase your iPhone 7 with recovery mode to remove your passcode instead. To do so, you will need a computer that runs the latest version of iTunes program. Step 3. Select your iPhone 7 from the list of available devices in iTunes. Reconnect your iPhone 7 to the computer. If you are prompted with the Trust This Computer alert, unlock your iPhone 7 and tap Trust to continue. Unplug all USB accessories from your computer expect for your iPhone. Try to use each USB port to see if one works. If available, try to use a different Apple USB cable. Restart your computer and your iPhone 7. If the computer is still unable to detect or recognize your iPhone, try to check the Device Manager to see if the Apple Mobile Device USB driver is installed. Or you can also try to connect your iPhone to another computer, if available. Otherwise, contact Apple Support for further assistance and other options. You need to encrypt your backup if you want to save Health and Activity data from your iPhone 7. To do so, just select or mark the box labelled as Encrypt [device name] backup and then set a password. Be sure to take note of the password as you won’t be able to recover your iTunes backups without this password. A padlock icon next to the name of your device indicates that the backup is encrypted. You can create a backup that is not encrypted if you don’t need to save your Health and Activity data. Step 4. Click the Back Up Now button. Doing so will instigate the backup process on your iPhone 7. Step 5. Wait until the backup process is finished. Once it’s done, you can see a message prompt saying that your backup is finished successfully. You can see this notification in iTunes Preferences-> Devices menu (Mac computer). If you are using iTunes for Windows, select Edit-> Preferences-> then select Devices from the menu bar located at the top of the iTunes window. Doing so will prompt you with the name of your device along with the date and time that iTunes created a backup. How to find backups of your iPhone 7 in iCloud? Go to Settings-> [your name] -> iCloud-> iCloud Storage-> Manage Storage. This is applicable to iPhone 7 using iOS 10.3 or later version. For iPhone 7 running on iOS 10.2 or earlier, head over to Settings-> iCloud-> Storage-> Manage Storage. On your Mac computer, you can find your iCloud backup by going to Apple menu-> System Preferences-> iCloud. On your Windows computer, you can find your iPhone 7 iCloud backup by opening iCloud for Windows software and then click on Storage. How to find backups of your iPhone 7 stored on your computer? Typically, backups created through iTunes are saved on the Backup folder under Users folder on your computer or through this directory: Users-> Backup. However, the location of the Backup folder varies by operating system. You can copy the Backup folder but you cannot and should never move or extract any of the backup contents to a different folder or storage drive. Relocating a backup file can likely cause the file to become corrupted or ruined. Click the Search icon or Magnifying glass icon in the menu bar then enter ~/Library/Application/Support/MobileSync/Backup/. This is the complete directory where the iTunes backup of your iPhone 7 is saved. Open iTunes on your Mac computer. Click iTunes in the menu bar. Click on Devices to continue. Control-click on the preferred backup. Select the option to Show in Finder. For iTunes backups that are no longer needed, you can move them (the entire folder) to another location such as an external drive or network storage location. Or you can just delete or remove unwanted backup file from your computer. To do this on Mac, head over to iTunes-> Preferences. On Windows, you will need to go to Edit-> Preferences-> Devices menu, and then select the backup that you want to delete. Finally, click the option to Delete Backup to confirm action.